Some sets are so rare, that even in the Internet age it's impossible to find much beyond a third-hand scan. T206 Wagners might be more valuable, but at least we know around 50 exist. Today's pre-war, 20-card Canadian popcorn set, on the other hand, only numbers to six cards total, one example each of a half-dozen players. 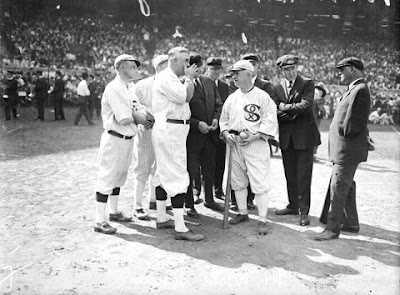 Its #5 card (of Black Sox manager Kid Gleason) is unique, barring further hobby discoveries from the Great White North. 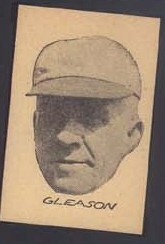 Chicago won the 1919 pennant in Gleason's first year leading the team, a thrill that turned sour upon learning that several players conspired to throw the series itself to Cincinnati. He continued to helm the White Sox through their "Eight Men Out" trial and banishment, but returned to bench coaching not long after and never took another job as manager. 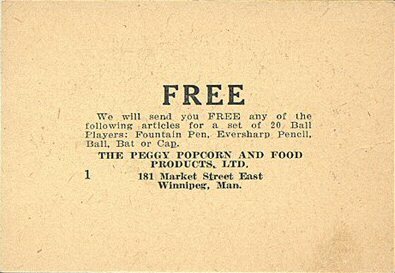 Discovered as a six-player lot at Toronto's largest card show in 2008, this handful of known Peggy Popcorn cards possesses special marketing significance as one of the hobby's earliest redemption sets. According to card backs, collectors could swap all 20 for "a Fountain Pen, Eversharp Pencil, Ball, Bat or Cap." It's unknown if Peggy added special markings to distinguish their prizes from dime store versions, so prizes might exist without an obvious connection to their origin. Companies typically short-printed at least one player to keep collectors from earning free stuff, so we assume that's what Peggy did, too. With just six known players and varying front designs, there's debate how Peggy built its checklist and exactly when it came out. Here's a breakdown of the half-dozen players and why they'd be included (checklist info from OldCardboard.com). Value: Robert Edwards Auctions sold #1 Joe Dugan for $2,644 in 2009, the only recent (and public) transaction of the six known cards; the other five purportedly reside in a private collection. One can only imagine how much the Ruth would cost! Fakes / reprints: With so few cards known (and all of them now graded), finding one at a show would be unlikely. Almost all transactions at this point will happen in the auction market. That's amazing, Carmen! Sorry you couldn't make that connection with her again, it sounds like a real "fish that got away" story for vintage collectors. In case you're tracking this article, do you remember anything about the other 14 cards, other than she said those cards existed?